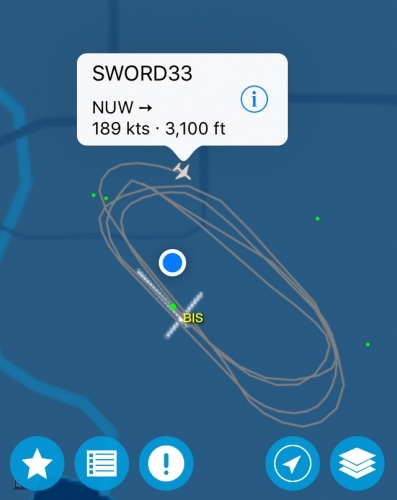 I walked out of a lunch appointment on Friday and immediately noticed a jet on a very unusual trajectory over Bismarck, far out of position compared to the track usually taken on approach to Runway 13. It was a short leg, and they were still banking south of Main Avenue. Even better, it was a touch-and-go. Well, being the curious type, I had to see what was up. That’s when I snapped this shot and realized it was a Navy plane, not some wayward bus driver or something. Just doing laps, as you can see. A few down the Runway 13 way, followed by a few down Runway 31. Cruising Main, almost. My flight app did give an ADS-B entry for this aircraft, but being a military plane that was all I got. The desktop app, however, was blank. 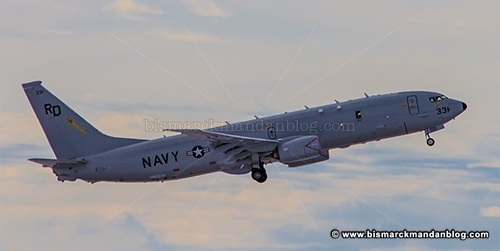 No worries, it doesn’t take long with “the Google” to narrow down that this is a P-8A Poseidon. There’s a good chance it’s from Whidbey Island, home to those F-18s which stopped in for A&B Pizza about this time last year. 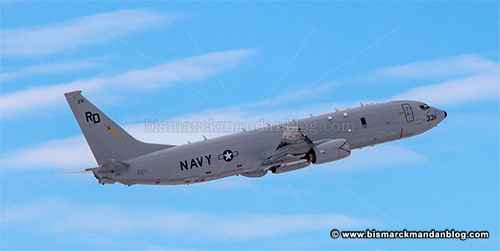 AirSOC has an article about the P-8A at Whidbey Island, which you can read here. This is a particularly cool aircraft (Wikipedia), even though it isn’t as exciting as a fighter jet. It’s a sub-hunter, and apparently a pretty modern one. Just like those F-18s last year, which are actually two-seater Super Hornets loaded with all kinds of electronic warfare equipment, this plane is chock full o’ goodies. First off, look at all the antennae on the top. The 737-800 this is based on doesn’t have those. It’s also capable of deploying anti-submarine weapons once it detects ’em. Sweet. Want to know more about some of the toys? Click on this link. A few more laps, and they were out of here. I listened to a little bit of the CTAF banter on my handheld transceiver, then went on with my day. I had put in a long week, and it was time to knock off early and play photographer for a while. This entry was posted in Cool, Military, Vehicles by Clint. Bookmark the permalink.